Skruf Slim Fresh Björnbär White Portion Snus is a regular strength slim portion snus flavored with blackberry and mint. While it may seem an odd combination at first, fruit flavored snus fans may want to give Skruf Slim Fresh Björnbär a try! 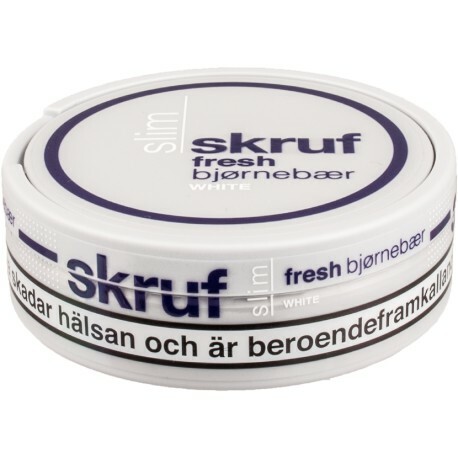 Skruf Slim Fresh Björnbär White Portion Snus was designed for the Norwegian market and their taste preferences. It is now available internationally (where legal) from great snus eShops like the legendary SnusCentral.com Snus Shop! This snus has a natural mint flavor with a subtle blackberry sweetness. The drip is slow and release quick. I find the release to be a little edgy, which is why I docked it a star. It's a refreshing mid-afternoon option that provides a lift until the 5 o'clock bell rings. It's fairly dry with a slow drip. I couldn't resist the recent special and had to pick up a roll. I'm glad I did. I got one can of this in an order from another website in the fall and enjoyed it so much I got a roll with my first order on here. The price improvement on this particular snus on SnusCentral versus other snus vendors was what made me make my first order/switch to this site (beyond that I loved Moe Unz's descriptions, the snus community and the many reviews on here). When I first tried this snus it became my favorite. It really does smell and taste of real blackberries - a real treat. And being generally a mint guy, the hint of mint flavor still freshens up my mouth and invigorates me enough that it is the first berry flavored snus which is a day-to-day one for me (and I love certain berry snuses - I just like mint more for day to day - this one does both). This, like all skruf white snuses I have tried, a longer-lasting snus, taking longer to run than the average white and much longer than the average original. It might not be strong enough for the high nic people but a perfect level for me. And as I said, a good deal on here. Love this snus. I never thought I would purchase a roll of a flavored snus but this is the exception. I flew through my first can of this and never got bored of it. I taste fresh mint leaves with some subtle but distinct blackberry notes. Makes a great all day snus or change of pace from other higher nicotine snus. need a discreet work snus as im a massage therapist breathing in peoples faces all day. Cant do high nic cause I dont want to get light headed mid session, nic level is just right portion size easy to hide in lip. It's minty with a hit of blackberries, saw some reviews say they dont taste the blackberries or smell them much but I sure do smell it and taste it. Overall good stuff stuff.